PLOS Paleo's Blog has an article about a newly described canine-like fossil from Egypt. Masrasector nananubis, or little "Anubis", was a dog-like creature that lived during the late Eocene about 34 million years ago. The researchers that authored the open access paper are Matthew Borths from Ohio University and Erik Seiffert from the University of Southern California. The specimens were collected over more than a decade from the Fayum Depression in Egypt. An interview with Matthew Borths is available here. The animal is known as a hyaenodont, which you might be able to guess from the name is a relative of modern hyenas and other doggos. In the past, these carnivores lived widely across Africa, Europe, Asia and North America, radiating after the extinction of the predatory dinosaurs. However, the relationships of these hyaenodonts has been difficult to resolve in the past due to their poor fossil record, which almost exclusively comprises tooth remains. This is especially the case for a sub-group called teratodontines, an Afro-Arabian group which Masrasector was part of. Thankfully, due to the amazing preservation of Masrasector’s skull, as well as some of its jaws and limb bones, researchers were able to show that Masrasector and other teratodontines were closely related to other hyaenodonts that had a hypercarnivorous diet – eating almost exclusively meat. 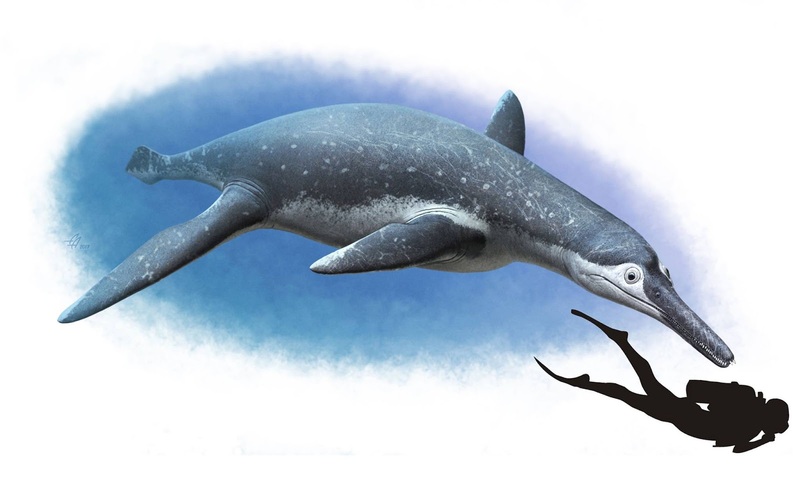 The Palaeocast podcast has a new episode on Ichthyosaurs. The discussion centers around a new documentary called "Attenborough and the Sea Dragon". Ichthyosaurs are large marine reptiles that existed for most of the Mesozoic Era. The most familiar forms superficially represent dolphins, but some earlier ichthyosaurs were more eel like. They could attain huge proportions, with some genera reaching up to 21m long. They were active predators feeding on belemnite, fishes and even other marine reptiles! In this episode, we talk to Dr Ben Moon and Fiann Smithwick, researchers at the University of Bristol, UK. Both have recently been involved in producing a documentary with the BBC entitled ‘Attenborough and the Sea Dragon’, so we have used this as an opportunity to discuss in great detail what ichthyosaurs are and get insights into the kind of work required to produce such a documentary. Fortune has a story about a diamond that weighs 1,109 carats. The stone, which was sold recently by the Canadian mining company Lucara Diamond, was discovered in 2015 at Lucara's Karowe mine in Botswana. This is the largest diamond found in the last century. The record is held by the Cullinan Diamond, which was found in 1906 in South Africa. After a year of negotiations, the British jeweler Graff Diamonds has bought the world’s second-largest diamond, the tennis-ball-sized Lesedi La Rona. The Canadian mining outfit Lucara Diamond (LUCRF) had been struggling to sell the 1,109-carat uncut stone, with a Sotheby’s auction last year failing to achieve the $70 million reserve price. Experts suggested the diamond was simply too big to allow accurate analysis of the gems it might yield. The highest bid in that abortive auction was $61 million. So, what did Graff pay in the end? $53 million. Graff already bought a fragment of the Lesedi La Rona rough earlier this year for an undisclosed amount. The smaller 374-carat diamond was originally part of the larger, but broke off during extraction. Graff described the new purchase as enabling a “poignant reunion” of the two pieces. CBC Radio's Quirks & Quarks has a segment about dinosaurs that fought with their tails. There were quite a few dinosaurs that evolved defence mechanisms centered around their tails. Examples are Stegosaurs, Ankylosaurs, and maybe some Sauropods. Modern animals with powerful weapons, overwhelmingly use their heads instead of their tails, think rams, deer, elk, with large horns. A paper, by Victoria Arbour and Lindsay Zammo in the Proceedings of the Royal Society B, speaks to why this has changed. To use your tail as an effective weapon, you likely have to be a large, armoured herbivore. That's the conclusion of a new study by Canadian researchers. Today when we see animals with powerful weapons, they are often found on the head. Think of rams smashing together their massive, coiled horns, or the crocodile's powerful jaws and teeth or a hawk's sharp beak. Nowadays, the list of animals that pack their weapons in the posterior is much shorter. But it wasn't always that way. Large, armoured dinosaurs like Stegosaurus and other prehistoric animals used to maim and kill with their tails. This week, researchers in Ontario and North Carolina published a study looking into why weaponized tails became such a rare sight in the modern animal kingdom. If you have some time, come join our work day at the warehouse on Saturday, February 10th, 2018 from 9:00-2:00ish. The warehouse address is 900 Knell in Montgomery, IL. Please meet/enter in the back of the warehouse ONLY. You will see railroad tracks along the back of the warehouse. Drive all the way to the end in the back. The PaleoFest 2018 speakers have been announced. It's an all-star cast all around! The dinner speaker is Steve Brusatte. His talk is titled "The Rise and Fall of the Dinosaurs". Many details can be found in the FAQ. The 2016 story included our friend the Tully Monster. The Chicago Rocks & Minerals Society will be having its 69th Annual Silent Auction on Saturday, March 10th, 2018 from 6:00 - 9:00 PM. The event will be held at St. Peter's United Church of Christ Gymnasium, 8013 Laramie Ave., Skokie, IL (across the street from the Skokie Public Library on Oakton). For more information, please contact us at info@chicagorocks.org or call Jeanine Mielecki at 773-774-2054 or Craig Heinze at 847-584-8637. Sorry for the late notice. If you have some time, come join our work day at the warehouse on Saturday, January 20th, 2018 from 9:00-2:00ish. The warehouse address is 900 Knell in Montgomery, IL. Please meet/enter in the back of the warehouse ONLY. You will see railroad tracks along the back of the warehouse. Drive all the way to the end in the back. The title of Dennis Whitney's talk at our January 12, 2018 meeting is “The Ordovician of the Anti-Atlas Mountains.” In the talk he will discuss his 2011 and 2013 trips to Morocco and the geology and paleontology of the various collecting sites which were visited. Ran across this recently... Enjoy! Sat, Jan 20th Warehouse Work Day, 9:00 AM - 2:00 PM - (Map) - Preparation for the 2018 Show in March. Please meet in the back of the building! The blog "Letters from Gondwana" has a post entitled "Top Fossil Discoveries of 2017". The entries include Borealopelta markmitchelli (the ankylosaurian "mummy" discovered in Alberta), Junornis houi (a new bird from the early Cretaceous), Patagotitan mayorum (the largest and most complete titanosaur discovered to date - from Patagonia, Argentina). There's a few more with some links to the original papers.